I had hard time labeling this post. I decided on dessert because halva is a sweet dish, but you expect desserts to make you happy, and halva is normally served on funerals and memorial services. Persian halva is very different than halva found in most Middle Eastern stores, so I did some research and here's what I found in Margaret Shaida's The Legendary Cuisine of Persia. "Halva was originally made in pre-Islamic Persia as a celebratory dish. Known as sen, it was a fudge made of sprouting wheat, dates, walnuts, fennel seeds, turmeric and oil, and it was prepared on the last day of the new year festival to sustain the ancestors on their heavenward journey following their annual visit to earth." “They continued to make sen (and still do in south-eastern Iran), but gradually another form of this fudge came to be made on the departure of loved ones to heaven. 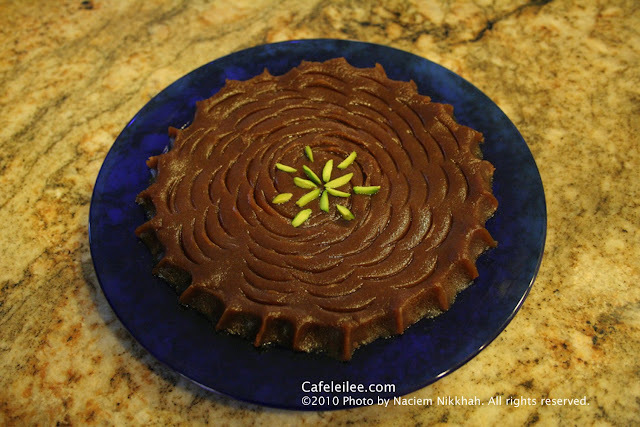 Today it is called halva, The Arabic derivative of 'sweet', and it is a plain sweet dish, made only on the occasion of the death of a close relative to be offered to mourners at the memorial service." I am dedicating this post to my two grandfathers, who passed away over 10 years ago. They were different in many ways, but were very alike when it came to helping others. In a medium saucepan, mix sugar and water. Place over low heat until the sugar melts in water. In the meantime, heat the vegetable oil in a large saute pan over medium heat. Mix in the flour. Keep stirring the misture for about 15 to 20 minutes, until ample dark in color. Add the liquid saffron and rosewater to the sugar mixture. Take the saute pan off the heat, and gradually add in the syrup to blend into a smooth paste (I suggest you wear a glove mitten for this step to protect yourself from the heat). While still warm, spread on to a plate and press down with the back of spoon, making a pattern with the spoon. pinch the edges with your fingures. نمیدونستم برچسب این پستم رو چی بزارم، حلوا غذای شیرینی هست که قائدتا مناسب برای دسر هست ولی وقتی دسر رو به کار میبریم فکر شادی و خوشحالی به ذهنمون میاد و از اونجایی که حلوا تو مراسم عزا پخته میشه فکر نمیکردم زیاد مناسب باشه. ولی به هر حال برچسب بهتری پیدا نکردم و همون دسر رو انتخاب کردم. توی یک کتاب انگلیسی زبان درباره غذاهای ایرانی کمی درباره تاریخچه حلوا یاد گرفتم که اینجا برای شما هم میگم. حلوا در اصل یک کلمه عربی به معنای شیرین هست، و در کشور های مختلف دنیا از یونان و همون کشورهای عربی گرفته تا هند همه یک جور دسر یا شیرینی به نام حلوا دارن که تنها چیز مشترک این شیرینی ها فقط همون مزه شیرینشون هست. توی این کتابی که من خوندم (ترجمه فارسی این کتاب هست غذاهای افسانه ای ایران) حلوا از قبل از حمله اعراب در ایران درست میشود و اسمش بود سن، که غیر از مواد لازم کنونیش توش گردو و خرما و تخم رازیانه هم ریخته میشد و معمولا روز قبل از نوروز درست میشد تا روح کسانی رو که در سال گذشته فوت کردن که به اعتقاد اون موقع ایرانی ها در این موقع به آخرت کوچ میکنن قوت بده تا راحت به اون دنیا سفر کنن. بعد از حمله اعراب دستور این غذا کمی تغیرکرد و اسمش هم به حلوا تبدیل شد. این پست رو تقدیم میکنم به دو پدربزرگم که بیشتر از ده سال پیش مرحوم شدند. هر دو خیلی چیز هاشون با هم فرق داشت ولی تو مهربونی و بخشش مثل هم بودن. روحشون شاد. آب و شکر را توی یک ظرف لعابی بریزید و روی حرارت ملایم بگذارد تا شکر در آب حل شود. توی یک ماهی تابه بزرگ که روی حرارت متوسط گذاشتید روغن را داغ کنید، بعد آرد را اضافه کنید و با روغن مخلوط کنید. مخلوط آرد و روغن را مدام هم بزنید تا رنگ آرد برگردد. حدود ۱۵ تا ۲۰ دقیقه. زعفران آب شده و گلاب را به شیره شکر اضافه کنید. آرد سرخ شده را از روی اجاق بردارید و شیره را کم کم به حلوا اضافه کنید و خوب بهم میزنیم تا شربت کاملا جذب حلوا بشود و حلوا روغن بیندازد. حلوا را در بشقاب بریزید و با پشت قاشق روی آنرا صاف کنید و دکور دهید. Hi & salam! What a great blog and wonderful cultural and culinary resource. I recently wrote a post about halva and research and asked high and low @ the origins of our halva and couldn't find an answer and all this time, the answer was here. I think you've done a good job producing content on this topic, but you need to move onto a different topic now. There are a lot of great topics to write on, but the best one is definitely related to orthopedics. Well i would like to share my info about to buy Anti aging products. That you can buy form here at https://ayuniorganic.com . I found Best eye cream for dark circles is outstanding form all of these to keep my face tight and young. And it will not say wrong this product work well. You should also use this one in your daily life routine.